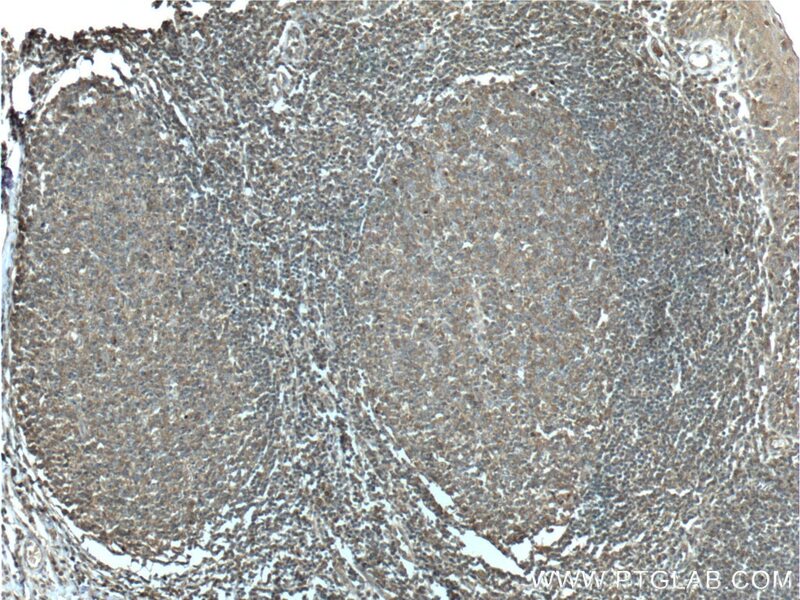 Immunohistochemical analysis of paraffin-embedded human tonsillitis tissue slide using 10735-1-AP( RAC2 Antibody) at dilution of 1:200 (under 10x lens). heat mediated antigen retrieved with Tris-EDTA buffer(pH9). 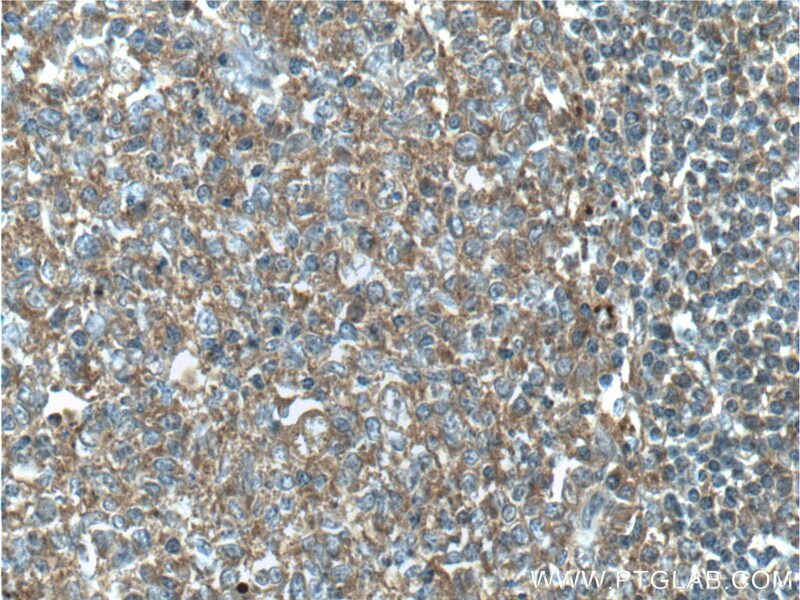 Immunohistochemical analysis of paraffin-embedded human tonsillitis tissue slide using 10735-1-AP( RAC2 Antibody) at dilution of 1:200 (under 40x lens). heat mediated antigen retrieved with Tris-EDTA buffer(pH9). 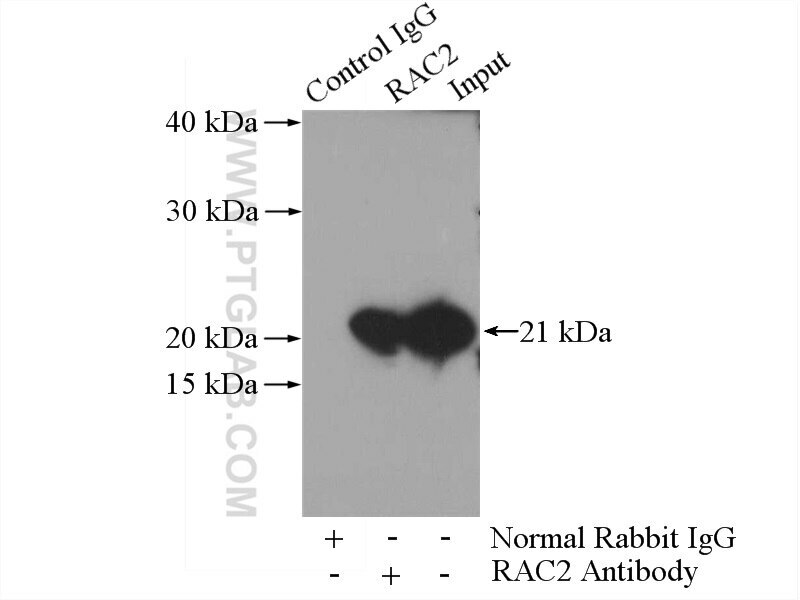 IP Result of anti-RAC2 (IP:10735-1-AP, 3ug; Detection:10735-1-AP 1:300) with HL-60 cells lysate 4000ug. RAC2, also named as GX, belongs to the small GTPase superfamily and Rho family. RAC2 is a plasma membrane-associated small GTPase which cycles between an active GTP-bound and inactive GDP-bound state. In active state binds to a variety of effector proteins to regulate cellular responses, such as secretory processes, phagocytose of apoptotic cells and epithelial cell polarization. RAC2 augments the production of reactive oxygen species (ROS) by NADPH oxidase. Defects in RAC2 are the cause of neutrophil immunodeficiency syndrome. In vivo RNAi screening identifies regulators of actin dynamics as key determinants of lymphoma progression. AFAP1-AS1, a long noncoding RNA upregulated in lung cancer and promotes invasion and metastasis.